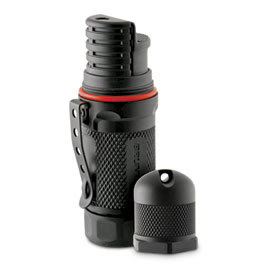 The firestorm is a weatherproof lighter by Brunton. The lighter measures 3.3'' x 1.8'' and weights 1.6 ounces. The ignition is piezoelectric and should be good for over 30.000 ignitions, the fuel is butane refillable as expected. The flame should be able to resist winds up to 80 mph. The lighter has a threaded cap with an o-ring to make it waterproof, the cap has a hole for a splitring or lanyard, there is also a metal clip in the lighter body to attach it to a pocket or inside a backpack. We found this lighter to be rugged and serviceable the construction is solid and the design looks very nice, the clip and lanyard hole are very good details for different carrying options. You can read more in Brunton's website and order for $48 from Tad Gear.